I also touched, very briefly, on gb. The talk went pretty well, I think, and there was good discussion during it. If you’re interested, here are the slides, and links to the four demo projects. And even though I didn’t use it during the presentation, I did knock up a demo of gb, which can be found at https://github.com/joeygibson/gb-demo. About a week ago, I decided to implement Conway’s Game of Life in Go. There was no particular reason, other than that I was bored, I wanted to do something else with Go, and I had never tried to implement Life before. Any live cell with more than three live neighbors dies, as if by overcrowding. That’s it. You start it up, and then sit back and watch for patterns to emerge. 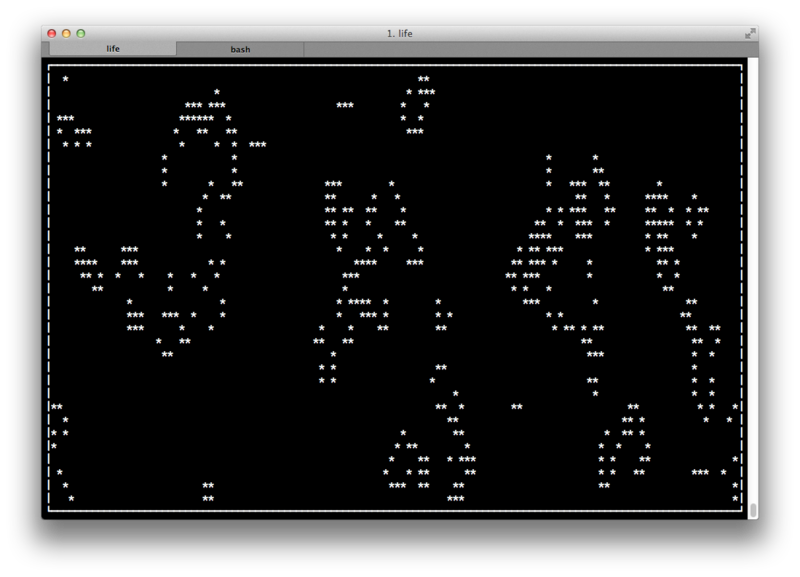 So far, I have a version that uses a portable curses-like library for console graphics. It runs on OSX, and should definitely run on Linux. The page for termbox-go says that it will run on Windows, but I haven’t tried it. I plan to build a “prettier” version using Gtk+, but that will take a little while, since I don’t know Gtk+ (yet!). If you want to see the code, it’s on github. and here is all the sample code that I showed, and here’s a PDF of the slides, in case you’d rather have that.